MEGADETH bassist David Ellefson says that the band will spend much of 2015 off the road working on a new studio album and "re-evaluating" its future following the recent departures of longtime MEGADETH drummer Shawn Drover and guitarist Chris Broderick. 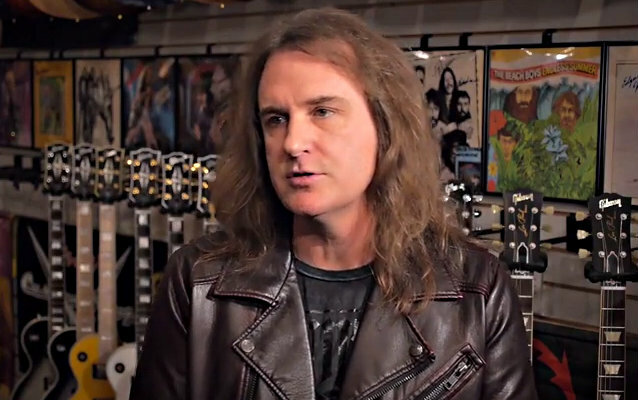 Ellefson, who was part of MEGADETH's classic lineup from 1983 to 2002 before rejoing the group in early 2010, is preparing to make a couple of appearances with METAL ALLEGIANCE, a project that was described in a recent press release as "a diverse group of metal legends interacting and performing together on the same stage." While promoting METAL ALLEGIANCE's upcoming concerts on this week's edition of "The Classic Metal Show" — in a joint interview with fellow METAL ALLEGIANCE performers Mike Portnoy (THE WINERY DOGS, DREAM THEATER) and Alex Skolnick (TESTAMENT) — Ellefson spoke about MEGADETH's future plans and how they affect his ability to get involved in outside projects away from his main band. "My attitude is 'play music I like with people I like.' End of story," Ellefson explained (hear audio below). "And I guess I kind of came to that conclusion about ten years ago as I was involved in a lot of other things outside of MEGADETH at that time." He continued: "Look, I'm glad to be back with MEGADETH. We worked really, really hard over the last almost five years. The day I came back, we went straight into the rehearsals for the 'Rust In Peace' 20th anniversary and we never looked back. I mean, we have basically been going non-stop until, really, just the last couple of months. And, obviously, lineup changes and things like that that happened, you have to kind of re-evaluate everything. "We are scheduled to go in and start a new MEGADETH record after the first of the year, [with plans] to release [it] later in 2015 and touring to take on from there. So, in kind of an ironic way, if there's gonna be changes, it's definitely better that it happens when you're off the road [laughs] than in the middle of a tour. So we're lucky. 'Cause we've had that happen over the years too, where members just [say], 'that's it,' they need to move on and they have to do it in the middle of a tour. Boy, that is really… You've really got your back against the wall. So we do have a little bit of a luxury of time right now." Ellefson added: "I think the fans know, just from our work ethic, and the quantity of material that we've been working on over the last bunch of years, I mean… I think MEGADETH is just never gonna go away; it's just always gonna be there. I realized that years ago. It's, like… You know what?! We've kind of outlived anything we thought we were gonna do and, in a way, MEGADETH has kind of outlived us — you know what I mean?! Meaning that it's bigger than any one of us, and it's bigger than even the four of us. Because we're now in our third… well, actually, heading into our fourth decade, and I see it in the shows. In the front row, there's these teenagers who have just discovered MEGADETH maybe at Hot Topic at the mall or something… I don't know. [Laughs] And then, in the back of the hall, there's people that have been there for ten, fifteen years, and up in the rafters are all the people who are like my age, who don't wanna get their head kicked in in the mosh pit anymore. And it's a cool legacy to see — that it's organically grown beyond anything, probably, we would have ever imagined. And now a lot of it is just, kind of, just be a good steward of it, be a custodian of it, take care of it, be there for the fans. And maybe that doesn't that necessarily mean that MEGADETH is just always gonna be out there hitting it, tour after tour, month after month, like we have been. At least certainly this next year, we're not gonna be. We're definitely gonna be off the road. And that opens up some opportunities to hang out with my buddies, hang out with my friends in METAL ALLEGIANCE. "I kind of try to leave some room in my schedule for the… when the phone rings… leave a little time open so that you can do some other things. Similar to Mike Portnoy and Alex Skolnick, who are involved in a lot of other different things, I was one guy in one band for 20 years, and then it came to the point where MEGADETH had disbanded back in 2002, and that opened up that season where I got to have a lot of different things and play with a lot of different people. And it's cool. I think it makes me a better MEGADETH musician if I get some time away from it once in a while as well and go do some other things and hang out with my buddies and just have those musical experiences. And I think the fans appreciate it, they like it. At this point, at our ages and stuff, I think our fans like to see us doing other stuff, especially when we're hanging out with other buddies in the neighborhood." Only hours after Drover announced his exit from MEGADETH on November 25 to "to pursue [his] own musical interests," Broderick revealed he also quit the legendary metal band, saying that he was leaving the group "due to artistic and musical differences." Speculation is rife as to whether fans can expect a reunion of MEGADETH's classic late 1980s and early 1990s lineup featuring Nick Menza on drums and Marty Friedman on guitar. Shawn joined MEGADETH in 2004 as the replacement for Menza, who had only just rejoined the group. Drover performed on four MEGADETH studio records: 2007's "United Abominations", 2009's "Endgame", 2011's "TH1RT3EN" and last year's "Super Collider".